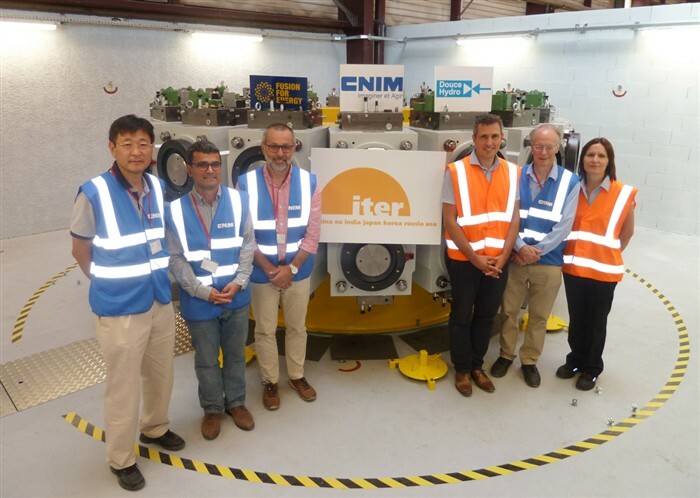 Members of the teams from F4E, ITER IO, CNIM and Douce Hydro in front of the Pre-Compression Rings tooling, CNIM, La Seyne-sur-Mer, France. A set of 18 Toroidal Field (TF) coils will create a massive magnetic cage to confine ITER’s superhot plasma. While keeping the hot gas away from the walls of the vacuum vessel, they may experience some fatigue or deformation resulting from the powerful magnetic fields. Nine pre-compression rings hold the key to the survival of the TF coils. They will need to be positioned at different levels—three on top and three below the inner “vault” formed by the wedged noses of the TF coils. An extra set of three will be manufactured as spare in case there is any future need to replace the lower set. The pre-compression rings have an inner diameter of approximately 5 m, a cross-section of nearly 300 x 300 mm and will weigh roughly 3 t each. They are made of fiberglass composite, consisting of more than a billion minuscule glass fibers, which will be glued together using epoxy resin. Europe is responsible for their production. While their fabrication is still ongoing, ITER International Organization (IO) has taken the initiative to develop a facility where they will undergo a series of tests. The contract has been awarded to the consortium CNIM/Douce Hydro. F4E has developed the conceptual design of the test facility and is responsible for technical progress. A brand new 140 m2 test facility, located in La Seyne-sur-Mer, is getting ready to receive the first pre-compression rings. The construction works are completed and the central beam has been recently installed. This central column will host a tooling of 36 actuators exercising a force of 1000 t each. The goal will be to test the fabrication quality of each of the pre-compression rings by checking their resilience to the high loads they will experience in operation. When one of them is positioned on the tool, the 36 actuators will start to operate simultaneously, maintaining a position accuracy of 0.1 mm while releasing a total force of 36 000 t. This stress test will last a few hours and will be supplemented by other tests to confirm that the creep and fatigue performance is also adequate. ITER Pre-Compression Rings (PCRs) tooling to test the resilience of the PCRs. It consists of 36 actuators that will exercise a force of 1000 t each. The tests will be carried out at CNIM, La Seyne-sur-Mer, France. Philippe Lazare, Managing Director of CNIM Industrial Systems Division, elaborated on the background and on-going progress. “CNIM, expert in manufacturing large parts of technical composite, and Douce Hydro, specialist in high-pressure hydraulics, have partnered to provide ITER with the Pre-Compression Rings Test Facility. The tight schedule has been respected, the study and the production has been delivered on time. In a few weeks, the machine that will be installed at CNIM will measure the millimetric deformations of the first rings subjected to exceptional mechanical constraints.” he stated.